It’s 19th September and we begin at the Saghalvasho raptor watchpoint, on a hill top overlooking the Black Sea coast just north of Batumi, where the Autumn 2017 count to date, starting on 17th August, amounts to a staggering 655377 raptors, including no less than 521687 Honey Buzzards! As soon as we arrive, vocal Bee-eaters pass high overhead, followed by a steady stream of raptors including, in order of appearance, Booted Eagles, Steppe Buzzards, Sparrowhawks, Hobby, Honey Buzzard, Goshawk, Marsh Harrier, ‘kettle’ after ‘kettle’ of Black Kites, along with several spiraling Black Storks, plus Short-toed and Lesser Spotted Eagles and a Peregrine. With so much action, the spotters’ hand counters click incessantly. Judging by the numbers, Black Kites were clearly the dominant species, and by the end of the day the resident volunteers had counted 9915 Black Kites alone, out of a total of 13781 raptors! After a very hearty lunch, arriving in wave after wave, just like the morning’s raptors, we head for the nearby Chorokhi delta, where two Kingfishers are displaying on the same branch. Next a male Little Crake boldly parades across a weed-covered channel, giving everyone stunning views, even including the red base to his bill. Other sightings here include Little Stint, Wood Sandpiper, Ruff, Garganey, Squacco and Purple Herons, Little and Yellow-legged Gulls, Turtle Dove, several Purple Swamphens, and a Quail flushed from undergrowth just five yards away from us! It’s another glorious sunny day back at the raptor watchpoint, where Red-throated Pipit is an early flyby, along with a low-flying squadron of Black Kites, and then a juvenile Lesser Spotted Eagle floats by below the hill in great light, showing all the details of its patterned wings. By mid morning, the ‘kettle’ is on and coming to the boil as clouds of raptors spiral along the valley before passing by, often at quite low levels, giving brilliant views, and among all the Black Kites and Steppe Buzzards we pick out numerous Booted Eagles and Honey Buzzards, the occasional Levant Sparrowhawk, Short-toed Eagle and Pallid Harrier, with diagnostic buff collars, as well as more Lesser Spotted Eagles, a Greater Spotted Eagle with more heavily spotted upper wings, an Osprey and a pale-tailed Long-legged Buzzard. 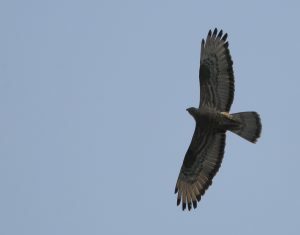 The entire show is a remarkable spectacle which has to be seen to be believed, and the grand finale to a fabulous morning is a juvenile Steppe Eagle, circling below eye level in perfect light, so that we can look down on the double white bands across the rich sandy brown upperparts and the broader white band across the under wings as it turns; a memorable sighting. After another five course lunch, an afternoon in the Botanical Gardens produces Short-toed Treecreeper and plum views of a male Krüper’s Nuthatch, obligingly clinging motionless to a tree trunk in that characteristic inverted inquisitive Nuthatch pose. Having admired every detail of its patterned face and chestnut breast patch, it is debatable whether or not this trumps the Steppe Eagle for bird of the day! Back at the hotel, there is still time to enjoy some interesting birdlife around the swimming pool! We begin the day with a pre-breakfast visit to the Chorokhi delta, where the Little Crake shows well again along with a larger Water Rail, while one of the Kingfishers is back on its favourite perch. Other sightings here include Black-necked Grebe, Black-winged Pratincole, Green and Wood Sandpipers, two Ravens and several Little Gulls, plus a Slender-bill and a black-winged Lesser Black-back from the Baltic, while six Yelkouan Shearwaters race by way out towards the horizon. After breakfast we return to the raptor watchpoint, where things are initially quiet apart from a couple of Lesser Spotted Eagles, good numbers of Booted Eagles and a few Short-toed Eagles, Black Kites and Honey Buzzards. 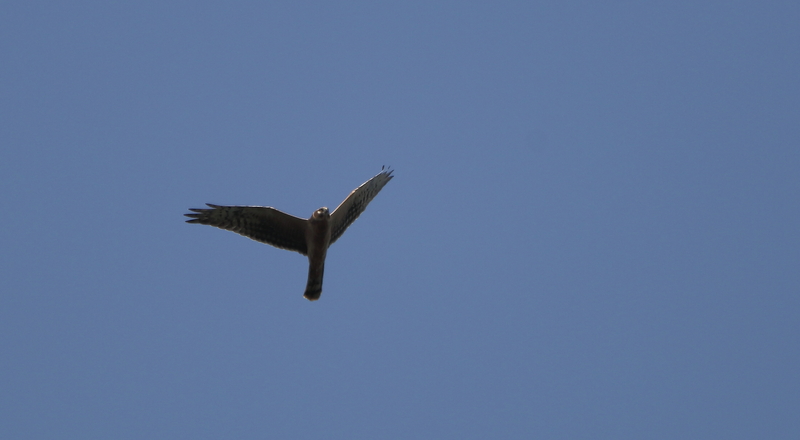 By mid morning the ‘kettle’ is boiling again as columns of Black Kites, Steppe Buzzards and other assorted raptors, including Marsh, Montagu’s and Pallid Harriers, spiral up on the thermals. Today’s count includes 18 species totaling 8930 raptors! This afternoon we visit a sandy river mouth further north along the coast, where we find White-winged, Whiskered and Sandwich Terns and several more Slender-billed Gulls, as well as Yellow-legged and longer-billed Caspian Gulls amongst hundreds of Little Gulls. There are also close views of plenty of waders and amongst all the Ringed Plover, Dunlin, Sanderling, Little Stint and Wood and Common Sandpipers, we find singles of Grey and Kentish Plovers, Bar-tailed Godwit, Temminck’s Stint, and best of all, a Broad-billed Sandpiper and a winter plumage Sand Plover, with a delicate apricot wash to the breast. Sand Plover identification in this region is complicated by the fact that the columbinus race of Greater Sand Plover which breeds in nearby Turkey has a shorter than normal bill, but after much scrutiny and debate its trailing feet in flight clinch it as this local race of Greater Sand Plover; a good result. Today we leave Batumi, heading east up the increasingly rugged and scenic Adzarists Kali valley, spotting Crag Martin along the way. Eventually we run out of tarmac and the punishing dirt road punctures one of the tyres, and so all the luggage has to come out to get to the spare tyre. After a lot of energetic straining and groaning, the driver realizes that his spanner is not up to the job of loosening the last of the stubborn wheel nuts. By now the provision of yogurt for lunch by the previous hotel, but without any spoons, no longer seems a problem. After hailing a number of passing vehicles for assistance with better tools, one enthusiastic passerby weighs in with a hammer, chisel and cigarette in a bid to split the nut apart! By now a small crowd has gathered, offering various pieces of advice, while the smoking ‘mechanic’ knocks ‘seven bells’ out of the nut, sending sparks flying! Along comes another passerby, with a substantially bigger hammer. The old saying “a sledge hammer to crack a nut” now seems quite appropriate as it eventually does the trick by shearing the entire bolt from the wheel! Our ‘mechanic’ then swaggers off, looking very pleased with himself. This is Roadside Assistance Georgian style, low tech but eventually effective, by which time, the mangled nut has absorbed so much kinetic energy that it actually feels hot! An hour and a half later, all the luggage is reloaded, and we are back on the road, with bananas all round for sustenance until a later than scheduled picnic lunch. Just as we finish our picnic, a shrill call from the nearby bushes attracts our attention and we are soon enjoying nice views of the ‘spray-tanned’ Caucasian Chiffchaff, so that’s one of the local endemics in the bag. It’s late afternoon by the time we stop for afternoon tea at the top of the Goderdzi Pass at over 6600 feet, and less than ten miles from the Turkish border, where we spot Water Pipit and several Black Redstarts, while every rusty tin shack roof seems to be covered in White Wagtails, as if gathering to roost. 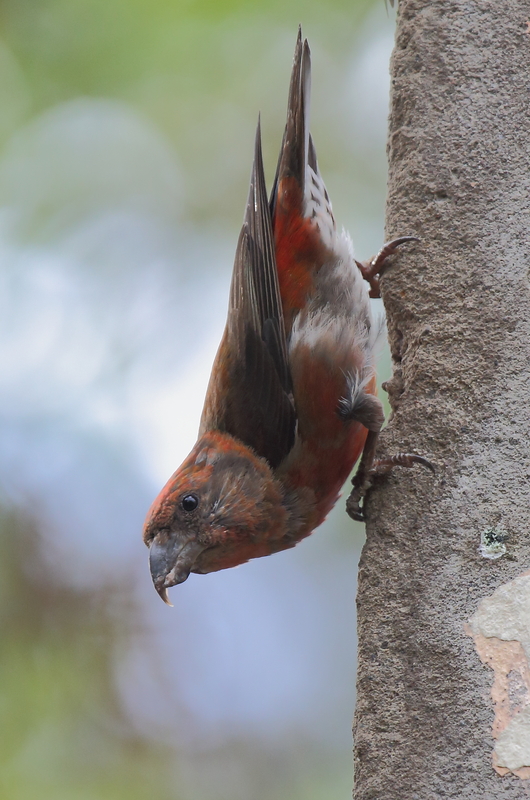 On one particular roof we also pick out an aptly named Red-fronted Serin, another regional speciality, producing cheers from the group. There are Red Squirrels and dozens of ‘chipping’ Crossbills in the pines outside our rooms this sunny morning, where a convoy of four wheel drive vehicles is waiting to take us up the nearby Zekari Pass in Borjomi – Kharagauli National Park. Above the mainly coniferous tree line is a stunning landscape of alpine meadows with blooming pink crocuses and spectacular rugged peaks. Hundreds and hundreds of Steppe Buzzards spiral overhead en route south along with the occasional Honey Buzzard, Sparrowhawk, Goshawk, Black Kite, Hobby, Booted Eagle and Lesser Spotted Eagle, but after hours of scanning the high slopes, we fail to spot any of our target ‘game birds’, and judging by the spent cartridges lying around, it looks as though hunters have largely cleaned them out, despite the area’s National Park status. There are also surprisingly few small birds apart from Short-toed Lark, Water Pipit, Wheatear, Dipper, Caucasian Chiffchaff and Red-fronted Serin. 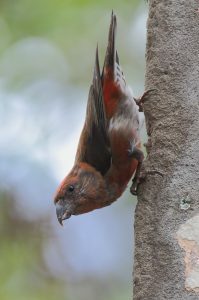 The Crossbills are showing really well again first thing this morning, with at least two dozen clinging to the side of a derelict building, unperturbed by their audience just yards away, as they are so engrossed in their ingestion of grit from the crumbling mortar. 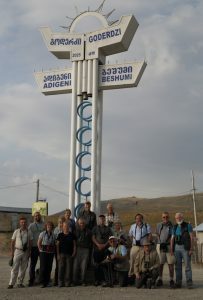 From here we drive further east, along the Mtkvari river, following signs for “The Border of Armenia”, with a stream of Turkish lorries coming in the opposite direction. A roadside stop by the river produces close views of another Caucasian Chiffchaff and an intricately marked juvenile Red-backed Shrike posing on top of a bush on the opposite bank. Eventually we arrive at Vardzia, where numerous ancient cave dwellings have been carved into the walls of the river gorge, now home to plenty of Crag Martins and Armenian Gulls. We arrive at our base at Valodia’s Cottages, a colourful floral oasis in this otherwise tinder-dry rocky landscape, attracting a nice selection of butterflies as well as Hummingbird Hawk Moth and Rock Bunting. After an open air lunch beside the river with home grown vegetables and freshly baked bread to accompany delicious barbecued trout, we explore the local area. First sighting is a Golden Eagle being mobbed by a much smaller Steppe Buzzard, followed by close views of a pair of Western Rock Nuthatches and then Whinchat and Stonechat in the same scope view. Further from our cottages, we find Woodlark, another Armenian Gull and a soaring Griffon Vulture. Back in ‘our patch’ new sightings include Blue Rock Thrush, Red-billed Chough and Kestrel as well as two more Golden Eagles; so not a bad list for a travelling day. It actually feels chilly this morning for the first time on the trip, and at 16°C, it is less than half the temperature of yesterday’s peak of around 34°C! During a pre-breakfast stroll from the cottages, the Rock Nuthatches are trilling and we can hear but not see Chukars calling, although a scan of the rocky slopes reveals Blue Rock Thrush, Ring Ouzel and a Golden Eagle, majestically surveying its realm. Setting off for Tbilisi, there are several Armenian Gulls standing on rocks along the river, looking reminiscent of oversized Common Gulls, with their greenish yellow legs and black-tipped yellow bills. Up on the Javakheti plateau we are back in raptor heaven with quartering Marsh and Hen Harriers, and a pair of Long-legged Buzzards circling with a considerably larger Greater Spotted Eagle. 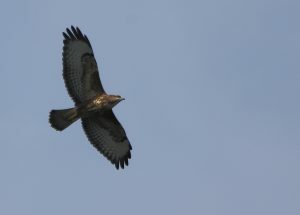 Throughout the plateau we find several more Long-legged Buzzards along with a gathering of Black Kites and eagles attracted by a ploughing tractor, including a Lesser Spotted Eagle in the same scope view as a bulkier Steppe Eagle, with a yellow gape extending behind the eye and a rich ochre patch on the nape. Passing through dilapidated villages on rough roads, with White Stork along the way, we eventually reach Madatapa Lake covered with wildfowl including at least 250 Ruddy Shelduck. 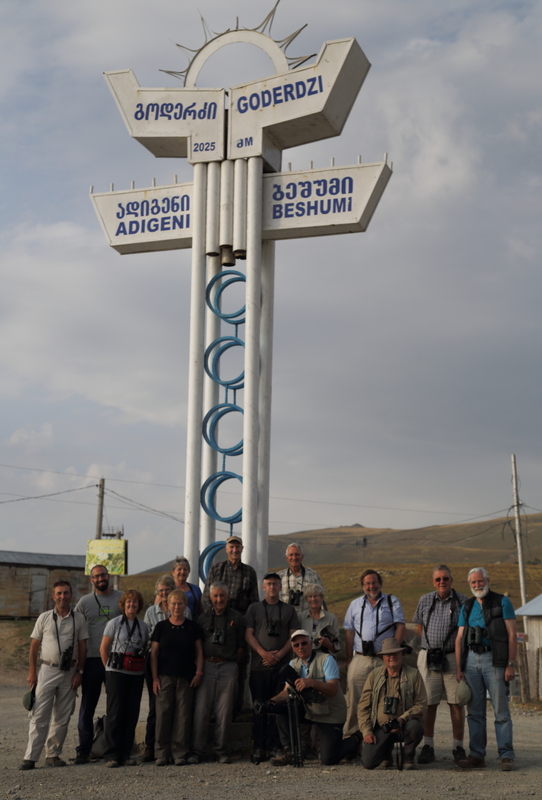 Our last stop is beside a small river not far from Tbilisi, where a congregation of small birds adds Grey Wagtail, Blackcap and Red-breasted Flycatcher to our list, bringing the trip total to 141 species seen including 22 different raptors!